So I just bought a new Xbox 360 and was quite surprised to find that there wasn’t any built-in wireless adapters that come with it. So I decided to look and buy one online. 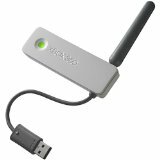 From what I can find, there are currently 2 wireless adapters for Xbox 360. You can click on the links below to compare the prices and buy the cheapest available. The main difference is that the second one supports the newer wireless 802.11n wireless protocol and thus can connect and transfer files at a faster speed.